The American dipper, a chunky songbird able to walk on the bottom of swift-moving streams, is one of the many species benefitting from removal of the Elwha dams, according to a new study. As for dippers in the Olympic Mountains, the arrival of salmon far upstream from the Elwha dams could boost the population of these marvelous birds, said to be America’s only true aquatic songbird. Since salmon put on most of their body mass in the ocean, the nutrients they bring back to their natal streams help feed an entire upstream ecosystem. 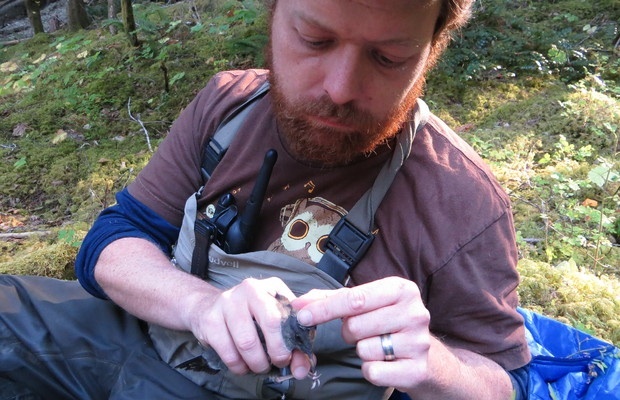 Two new studies led by Christopher Tonra of Ohio State University demonstrate the rapid recovery of the American dipper in the Elwha — a faster recovery than anyone expected. It also offers hope for a quick turnaround from dam removal in other areas. Christopher Tonra of Ohio State University bands an American dipper in the field. The studies by Tonra and his colleagues showed that American dippers with access to salmon contained more marine-derived nutrients. They were 20 times more likely to attempt multiple broods and were 13 times more likely to stay in one area year-round. Their adult survival rate was 11 percent higher than in areas without salmon. Females with access to salmon had larger body mass, suggesting a healthier condition, and their female offspring also were larger. The American dipper is considered an indicator species for freshwater quality, according to the U.S. Fish and Wildlife Service (PDF 4 mb). Where dippers are plentiful, the streams tend to be healthy. The biggest surprise to the researchers was how quickly the salmon returned, providing a growth opportunity for many wildlife populations. “It was pretty much as soon as the first dam came out and fish were beating up against the second, wanting to go,” Tonra said. Tonra was previously associated with the Smithsonian Migratory Bird Center. Others involved in the project were Kimberly Sager-Fradkin of the Lower Elwha Klallam Tribe, Peter Marra of the Smithsonian, Sara Morley of Northwest Fisheries Science Center and Jeffrey Duda of the Western Fisheries Research Center. I found the following video on YouTube and had to share it. The video, taken at Vancouver Aquarium, shows an unusual interaction between a dipper and a baby beluga whale.